[Stone Jounin] Sajime Sahori - Engi no Jutsu - The Best Naruto RP on the Net! Sahori’s commanding charisma and confident stature are befitting a shinobi of her rank, her grace and elegance a mirror to her privileged and wealthy lifestyle. Access to the finest tutors and schooling that money and prestige can find have molded her into a sharp and poised representative of the Sajime Zaibatsu as a whole, with every movement like a practiced and careful dance. Her thick and voluminous hair is the color of dark soil, typically cut into a bob style and carefully brushed and straightened to frame her face, trailing her strong jawline to her pointed chin. Her relatively wide face and small, protruding ears are complimented (or, perhaps, disguised) by this style, so despite it being a relatively simple style compared to her younger years, it’s become her standard. She has wide, expressive eyes – light brown that catch and reflect light like a gemstone. The bridge of her nose is almost non-existent, brushing into her soft face, and her wide nostrils used to be a source of embarrassment...but with age, she’s learned to embrace it. 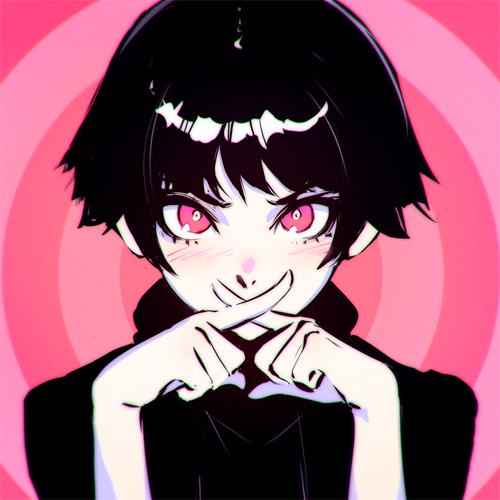 Combined with the pink tone to her flushing pale skin, she’s owned any comparisons to a cartoon pig by adopting a teasing “buu*” noise while flaring her nose. Having been an active shinobi for so long, her body-type is far beyond fit compared to civilians of her age, but she’s started to compare herself to other kunoichi – she’s of a small frame, her muscles lean and rippling under her skin. She has pronounced collarbones and wider hips, strong legs from a lifetime of running around tossing jutsu rather than scuffing on the front-lines. Her voice, like her poise, is a practiced neutralized accent from years of vocal training. She sounds like she’s from neither here or there, and is skilled at blending in down to her voice when it comes to subterfuge. Her natural voice and accent firmly places her as a country girl from the mountains, a honeyed rush of excitement. Underneath her right armpit is a small tattoo of a cross mark. When deciphered by the appropriate Iwagakure-style fuinjutsu, it would reveal her name, for purposes of corpse identification. A failed assassination attempt has left her with a wicked scar across her throat, which she covers up always. 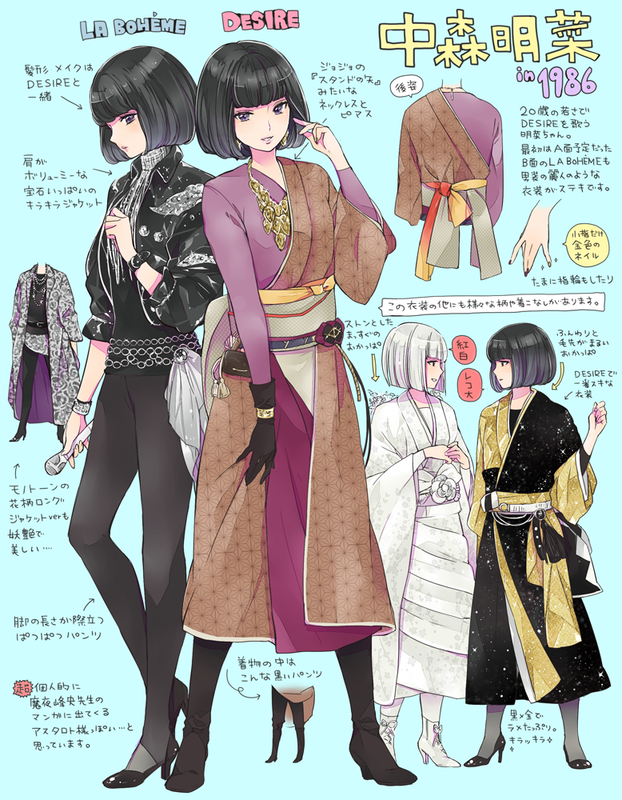 While tirelessly active on the three fronts of her life (as a kunoichi, as a businessman, and her personal life), her wardrobe has become routine enough to take the guess work and planning out of her clothing. Her shinobi garb changes depending on her mission status. For combat missions, she wears a standard Iwagakure shinobi uniform, appropriate for someone who places the excellence of her shinobi training on full display. Rust colored robe covers her from neck to ankle, with a thick turtleneck to hide her scar, with flowing sleeves to allow for her more complicated handseals as a ninjutsu specialist. Underneath that is the loose chainmail mesh appropriate for all modern shinobi villages and a pair of traditional shinobi sandals, and above it all is a brown flak jacket. She wears her forehead protector over her right arm, and a patch with her family’s symbol over her left shoulder. Occasionally, she’ll be expected more formal dress while maintaining the persona of a shinobi, where she opts for ornate robes and sashes, mixing browns, rust colors, and yellow as befitting the theme. These tend to be fairly ornate, to represent the glorious wealth of Iwagakure and her own personal family’s independent wealth. For shinobi actions where representing Iwagakure takes a back seat (secret assassinations, etc), or in what passes for ‘casual’ shinobi work, she wears a simple black jumpsuit that mutes her features and allows freedom of movement. For business, the Sajime clan favors all black, to contrast their white cross mark symbol. It used to express humbleness and the concept that all parts of the family had an equal share, but the modern Zaibatsu sees the rich black fabrics as a display of wealth, the lack of excess a display of finding their intense luxury a bore, and a sharp contrast from the “working” patterns of the lower classes. She wears her headband around her neck to hide her scarring, and to display her rank as a jounin shinobi on top of her status in the company. 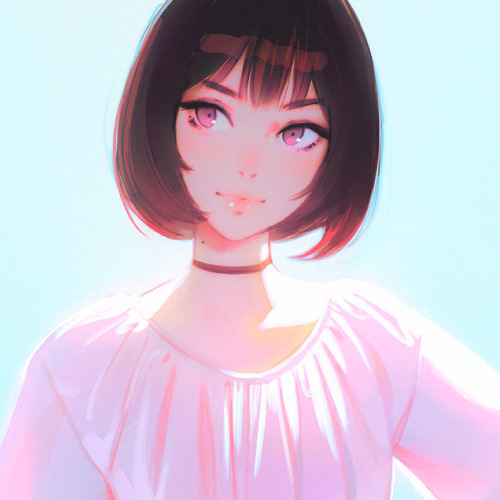 Finally, during her personal life, Sajime Sahori favors simple and light clothing – either reflective of her surprisingly upbeat personality, or to create a stark contrast to the drab and dull colors that make up her working uniforms. Here, wears a simple choker to hide her scarring. The great shame of good business is that you have to exploit and manipulate the weakness of your rivals to become strong. Corporate interests are a step removed from the humanity of the company, and it makes it easier to justify leaving others suffering in the wake of the glory of your growth. An ideal deal ends with both parties benefiting from it, but if you can’t have that, it’s better not to be on the short end of the stick. This simple concept of dealing has been trained and drilled into Sahori since she was old enough to understand the gravity of her position as a leading member of the Sajime empire. It permeates her entire being, a nasty monster that’s constantly looking out for her primary interests over those of others around her. Selfishness is an other way to describe it, and sometimes that realization weighs down on her consciousness. This mindset helps her punctuate ideals of justice and fairness – since those are the ideal – but also allows her to make tougher decisions relating to benefiting from poorer situations. Her confidence and frank nature inspires trustworthiness, and she excels in leadership positions because of it. Because of this, she’s become stubborn, aggressive, and self-involved. She has a grand understanding of the importance of teamwork, but interpersonal relationships are difficult when you live a life of utilitarianism. She’s focused on her own goals and her own motivations, her own missions and her own orders from the Tsuchikage, and that distracts from the things that make true friendships: selflessness, caring, sacrifice. 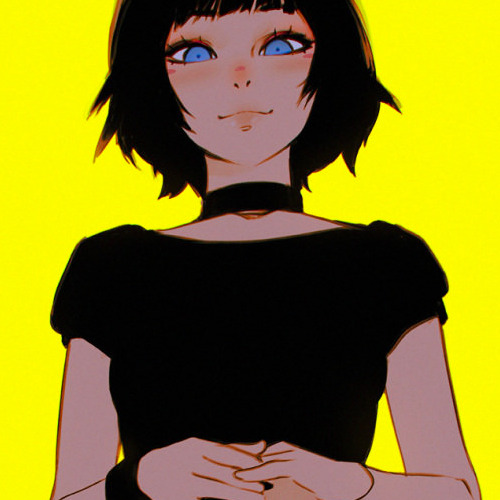 She’s been more motivated lately to change it, but finding someone that she can see and treat as a true equal is difficult – the gulf of her wealth, prestige, rank, and combat skill makes it too difficult to see eye to eye with many other people: the loneliness of the elite. So, perhaps surprisingly, she’s got a perky and upbeat attitude. Confidence married to determination means she sees the bright side to many negative situations, and her leadership skills and training makes her excellent at manipulating people – particularly inspiring them to overcome their own obstacles and to persevere. She has a generous heart, willing to go the extra mile to assist someone else to see them improve, if only to satisfy her own ego. This generosity is related to her predatory dealing – investing in others to improve them creates stronger allies, stronger partners. She has a strong personality and sense of self, an overwhelming independence from others. She romanticizes love and personal relationships, painfully unaware of the reality of the day to day of those things. She’s quick to move along and move forward from negative experiences, but occasionally all that all that positivism leaves her with a hangover – she’s prone to depression and anger when she’s reached the end of her coping. This gives her a nasty reputation of being a bit two-faced, smiling one moment and angry the next. It’s these extremes that generate her greatest downfalls – it’s difficult to make real, lasting connections when you’re not in balance with yourself. Being a high ranking shinobi separates her a bit from the typical corp girl, for while she has loyalties to the Zaibatsu and a love for her family, a shinobi’s first loyalty is to their village. The seat of the Tsuchikage might come and go, and the political strife of the village might stress relationships, but ultimately, Sahori has inherited the Will of Stone (Ishi no Ishi). Her glorious purpose and ultimate goal is to leave behind an Iwagakure that she can be proud of - - a successful paramilitary business venture, a generation of powerful shinobi, and a love and pride for the surrounding country. Hope, that divine call of the Yellow Army. Sahori knows it well. Nindo; "Way of the Ninja": "Always and everywhere, be right and good." A shinobi must always believe in themselves and their mission -- hesitation is the greatest shinobi killer. If it's the right thing, or if it's a good thing, then do it. Ishi no Ishi; “Will of Stone”: "The nature of the bricklayer is irrelevant. A castle made from solid foundation and materials can protect what is precious to us." Combo Special: Twice per thread, the Savage's beast can use one Ninjutsu technique the Savage knows. The jutsu used each time must be different, and they count as part of the Savage's given uses for that jutsu per thread. A Large white tiger with black bangles and yellow eyes and threatening, speartip claws. She can take on the form of a human woman, deceptively small in stature with a mess of thick grey and black hair, and those same gleaming cat’s eyes on a stern and sharp face. In her human form, she wears traditional garments for a shrine maiden, albeit in a style long since dated. 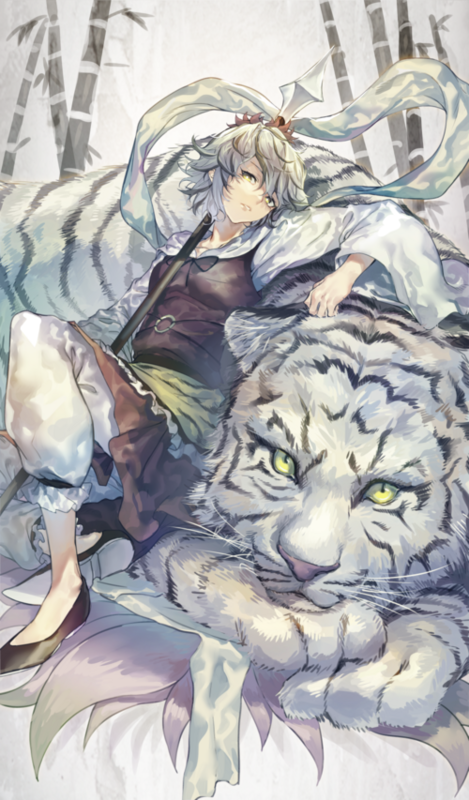 Byakko, White Tiger of the West is an ancient shrine guardian made manifest – a stern and stoic protector of the Right and Good in the world, seemingly humorless...but, like most cats, she has a playful (if predatory) streak. She once was a glorious beast of immense power, but years being locked to a forgotten shrine have dulled her claws. She’s eager to have a return to glory, at the side of the shinobi that espouses her great principle of the Tao. The Sajime Zaibatsu is a testament to the rocky political climate of the Earth Country – for some, a painful reminder of the effects of greed on the population and the general opinion of shinobi in the greater country, and for others, a testament to Earth Country resilience. For the last two hundred years, the Sajime family has been producing shinobi tools and providing generations of skilled shinobi to Iwagakure, flourishing most noticeably under the Sandaime, and then again under Shichidaime, where the family successfully cannibalized many rival production houses both inside and outside of Iwagakure. As the Sajime family grew in prominence, their ties to Iwagakure became more and more secured – as their wealth and connections grew, slinking through the international shinobi community like vines, they had many opportunities to leverage their standing in Iwagakure and the greater Earth Country to trade secrets for secrets and additional profit—but time and time again, the heads of Sajime placed loyalty over that profit. Due to their explosive growth during the most troubled times of Earth Country's recent history, there are those who would besmirch the name of this great House of Iwagakure, but the cold truth is that all shinobi profit from the outbreak of war and civil unrest. The primary house of the Zaibatsu (Sajime) is a relatively small family, now primarily made up of administrators, high-ranking shinobi, and the occasional engineer. The Sajime family's roots are in explosive shinobi tools, making use of black powder and fuinjutsu for their most popular product: the explosive tag (kibaku fuda). It is from this main house that the Zaibatsu takes their name, and where the most sterling examples of their "corporate shinobi" hail from. 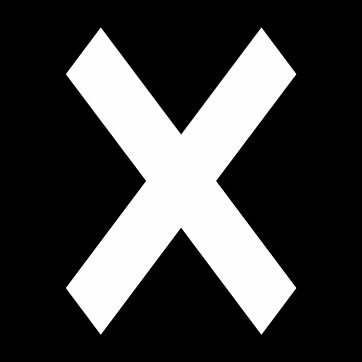 Their crest (kamon) is a simple white cross mark over a black background. Sajime shinobi are notorious for their use of their family's shinobi tools as well as demolition and explosive arts. Hope – aspirations, desires, wishes, expectations, ambitions, goals. When Sajime Sahori was born to that illustrious and storied merchant house, the zaibatsu as a whole was in a period of economic decline. In order to maintain their good standing with their perennial protectors of Iwagakure, all children were submitted to the shinobi academy, in a desperate attempt to maintain a good standing with the Tsuchikage when profits were at a historical low...and of her generation, Sajime Sahori was the best to represent those lofty expectations. Called “Sasa”, or “bamboo shoot” both due to the repeated syllables in her name as well as her uncommon growth (both physically and academically), she was to be the flower that grew from the compost of the clan’s pride. She represented hope for the family, and she was constantly reminded that the success of the family rested squarely on her tiny shoulders. It was an intense burden that she took to well, Sajime women being notoriously passionate and powerful individuals. She was the first in a long line to have to take up the shinobi oaths – and a desperate long shot. If she could find success as a shinobi, her family name’s honor would remain intact. Of her seven siblings, all ambitious in their own rights, she was the only one who successfully made a shinobi career. Her four older brothers didn’t have the discipline for long nights of study and training, her elder sister was prone to sickness, and her two younger siblings – a boy and a girl – were too gentle for the life of a shinobi. Her graduation from the academy, when she received her shinobi headband, was a cause for great celebration...Sasa would be the hope of the family. She was assigned, as was popular at the time, to shinobi cell consisting of a jounin sensei and three genin, of which she was the only female and the only not to belong to a prestigious shinobi family. While she had graduated near the top of her class, these other two had been the true shining examples of Iwagakure shinobi stock, and the gulf she felt between them was almost immeasurable. 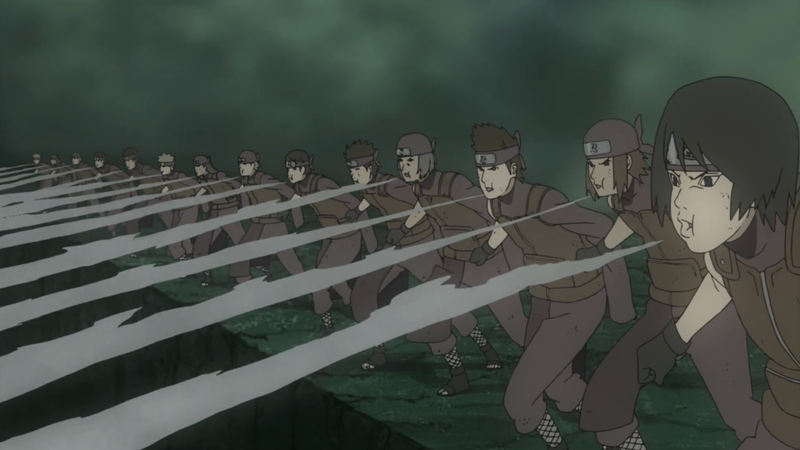 “Team 15”, made of the top three candidates from the academy, was to represent the best that the village could produce, lead by a jounin with years of experience and an impressive command of dozens of jutsu. Team 15 was one of results. Even at their young age and relative inexperience, these top performing genin constantly overcame the obstacles before them, through an intense intercell rivalry as well as a desperate need to live up to their family names. For Sajime Sahori, it was an opportunity to show that her family of traders, engineers, and businessmen were just as successful as paramilitary operators – for the other two, it was an opportunity to live up to their already impressive lineage. Within their first 8 months of activity, they were entered into the Chuunin Exams, hosted by Konohagakure, and very easily dominated their way to victory. During this time, her four other brothers revolutionized the fuinjutsu process of creating explosive tags, the original product of the Sajime family some centuries ago, and business boomed, leading to explosive profits for the main family and in turn, for the rest of the zaibatsu. Sahori came home bubbling with pride for her accomplishments, and was relegated quickly to being a corporate shinobi for the zaibatsu – removed from her cell and assigned full time to tackle the interests of her family’s great merchant empire. While she was proud to be of service to the clan, Sahori couldn’t get the bitter taste from her mouth. Her chuunin years were a period of great change for Sahori. While she split her time between her offical Iwagakure duties as an assassin and as a cavalier for her family’s interests, she became crushed by the realization that she had become little more than a tool for her family’s use. She had sacrificed her future as a businessman and merchant to take up the killing arts for this clan, and after all that struggle, she was reduced to a simple bodyguard and tool to spread their influence. She was good at it, but it was Iwagakure that made her good at it. Here is where she learned of the will of stone – a hushed philosophy of self-sacrifice for the greater good. Her siblings, sweet and understanding of her concerns, did their best to include her in the business side of the zaibatsu, until even the stubborn higher administration – her grandparents and their generation – had to admit that she was an undeniable asset both inside the boardroom and outside of it, ever much deserving of her Sajime name despite her bloodied hands. Still, it was Iwagakure’s influence on her life that molded her to the woman she is today: her life separate from her family as a shinobi was where she found true growth. Her study of the chakra arts, her teams and assignments with the other shinobi, she always always seen as an equal – something that she had earned rather than be born into. As she managed both the finances and the bloodletting for the zaibatsu, she became a friendly and well-received face amongst the other companies – a shinobi that felt like a companion was a lot less frightening than a stone-faced killer. With her siblings help and her own efforts both on the field and in the office, she helped secure the Swamp-Earth trade-line for the family, opening satellite storefronts through Iron, Coal, and Swamp, while being secure against the political unrest of Rice and the hostile terrain of Snow country. This tradeline was named in her honor (The Bamboo Road), and fully secured her business acumen as something to be respected and even feared. As she continued to excel in her shinobi career, she was promoted to jounin at the age of 22, at this point well regarded for her determined attitude and impressive track record of successes since she was in the academy – and become the highest ranking shinobi in Sajime employ. It was no doubt, during the recent disaster in Jondori, that she was one of the first responders. Her impressive skill in doton allowed her to save dozens of civilians during the earthquakes, but for every single soul she saved she saw a dozen more crushed and dying – a horrible stain on her heart. It was during a non-shinobi action when she suffered personally for the riots, however. Representing her merchant house, unarmed and unaided by her typical allies, she was alone with other members of her family in a small town in the outskirts discussing the opportunity to incorporate local businesses under the Sajime umbrella, when the blacksmiths she was dealing with picked up their weapon offerings and suddenly struck out at her, in retribution for Jondori quakes when her status as a shinobi was revealed off-hand. Cut across the neck, it was only the efforts of her tireless companion Byakko that she made it safely to medical rescue. During her recovery, she was reorganized as a propagandist in the new Yellow Army, under the IWA banner. She was already a walking, talking example of the best Iwagakure had to offer, and continuing to offer outreach programs for the civilians of the country on both fronts – as a merchant and as a shinobi – despite the attempt on her life, quickly has made her an endearing example of the public relations of the village. Sajime Sahori believes in hope, in all its forms: a greater Iwagakure, a stronger Earth Country, a balanced philosophy, and the new generation of shinobi and merchantmen to bring peace to this world of strife. - She's well renowned for her chakra control and hand seal completion speed. Her doton is lightly dusted with glimmering, sparkling diamond like structures that have no effective value. They dissolve into rough carbon as soon as they're touched. - "Ya'll," "buu! ", and "sure, sure"
Moved to character registry. Her swaps and beast master considerations are found here. So which one is the beast in this relationship, the tiger or the pig? At any rate I'm glad I can finally direct all my e-tag related rage at a specific group of people now. Clearly these Sajime folks are to blame for everything wrong in the shinobi world. Half approved since it looks like everything is fixed. After having Junge do the math for me--I don't mind throwing down a half-approval. Talked plenty about Sasa and a bunch of plans for months now, looking forward to seeing how things go! Didn’t jounin take 17 jutsu at creation at one point? I’m not crazy, right? Sitting at 1.5 currently. Weekly bump.